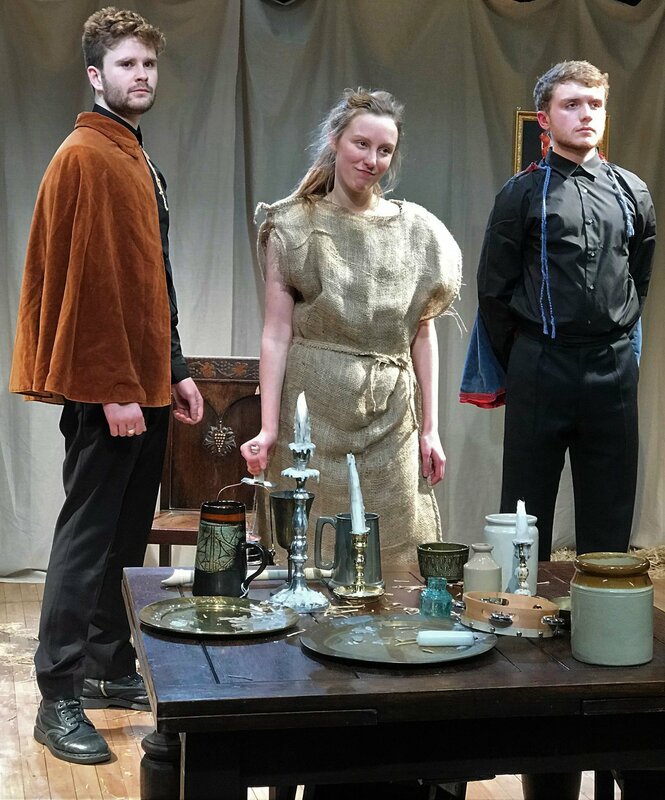 Pirandello’s Henry IV is student drama at its very best. At an hour long in the small, cosy bowels of the Burton Taylor Studio its unassuming scale allowed for a far greater depth and focus in what was probably only around three weeks of rehearsals. Packed with Stoppardian wit and uncomfortable, confrontational truths I really hope Oxford will see more from both the cast and crew of this production. Kathryn Cussons was a marvel, giving an all-consuming performance as the unhinged, conniving Henry whose only hold on power is drawn from others’ acceptance of it. Combining neuroticism with frightening lucidity and clarity of deliverance she was a spellbinding lead. The surrounding characters clustering around the stage in the first half, waiting to see Henry for the first time, were a melting pot of quick comedy (Sunny Ramamurthy’s comedic timing was particularly on point) and disturbing, complex tensions. The play disconcertingly breaks apart the idea of a character, building up an idea of Henry long before he himself appears, filtered through the different perspectives of the other characters. It’s a highly intricate network of relationships, motives and viewpoints that the cast drew out with remarkable ease. It must also be said that this was one of the best staged student productions I’ve seen at Oxford. On a student budget it is incredibly easy for thriftiness to become tackiness or crassness, which was impressively avoided in Henry IV. Straw cluttered the stage along with pseudo-medieval portraits, candles and beakers, resembling a 19th century idea of what the Middle Ages might have looked like, as the characters (set in 1920s Italy) seek to dress up as medieval characters. The play mediates on what happens when you admit that what you see on stage isn’t real, and this was brilliantly paralleled by a set design that reflected a fictive visualisation of an era, rather than its reality. At the end of the play the studio lights plunge the whole room, audience and stage, into electric view in stark defiance of the medieval fantasy Henry has created for himself. The director and lighting technician then rush onto the stage to grumpily rearrange the cast to their original, opening positions. It’s funny, apt, and semi-pantomimic, bringing to a close what was a wonderfully intricate and light-footed performance.